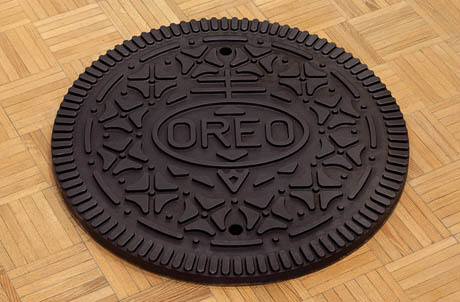 IMAGE: Oreo manhole cover, by Andrew Lewicki, an LA-based artist whose work also includes crates of Southern California concrete oranges and a combination ashtray/juicer, for the perfect Parisian breakfast. IMAGE: The late, lamented Hydrox cookie, whose pattern is, according to Goldberger, “at once cruder and more delicate than the Oreo’s; the ridges around the edge are longer and deeper, but the center comprises stamped-out flowers, a design more intricate than the Oreo pattern.” Photo via Wikipedia. IMAGE: The evolution of the Oreo emboss, from 1912, to 1924, to today, courtesy Nabisco, via The New York Times. In reply to Greenbaum’s post, a comment by “Bill,” who claims to be William Turnier’s son, raises the intriguing possibility that the original blueprints for the Oreo emboss may be hanging over the door of a family room in Chapel Hill, North Carolina. I hope design museums around America are sharpening their acquisitionary claws. As it turns out, online Oreo-obsessives have spent as much time decoding the design as they have speculating on the identity of the designer. The circle topped with a two-bar cross in which the word “OREO” resides is a variant of the Nabisco logo, and is either “an early European symbol for quality” (according to Nabisco’s promotional materials) or a Cross of Lorraine, as carried by the Knights Templar into the Crusades. Continuing the Da Vinci Code-theme, the Oreo’s geometric pattern of a dot with four triangles radiating outward is either a schematic drawing of a four-leaf clover or — cue the cliffhanger music from Jaws — the cross pattée, also associated with the Knights Templar, as well as with the German military and today’s Freemasons. 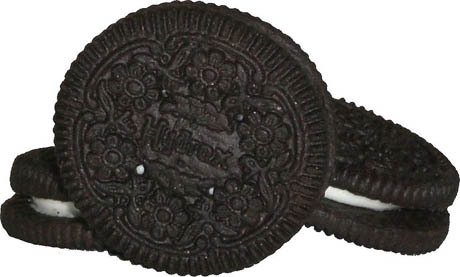 No wonder the Oreo has become the most powerful cookie in the world, with more than 491 billion sold to date. 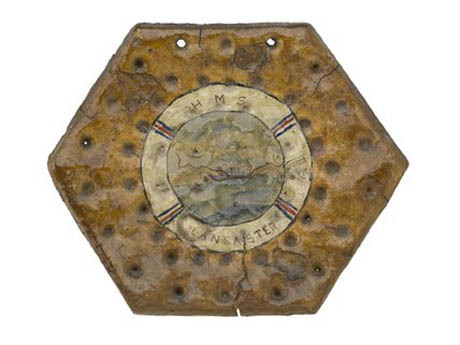 IMAGE: A hexagonal ship’s biscuit, painted by an anonymous sailor, and showing evenly spaced docker holes, c.1906, National Maritime Museum. Meanwhile, across Europe, a parallel and equally time-honoured tradition of decorative waffle irons and wooden moulds emerged, used to emboss religious symbols on communion wafers, coats of arms on Italian pizzelle, and courtly imagery on German springerle. 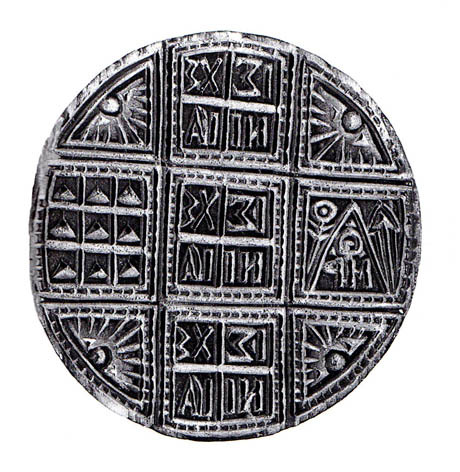 IMAGE: Wooden eucharistic wafer stamp from Epirus, Greece, via A History of Food by Maguelonne Toussaint-Samat. The turn of the nineteenth century saw the birth of the industrial biscuit, and, with it, the marriage of these two morphologies — docking and decorating — into an automated production line. In the late 1890s, two cousins, both called Thomas Vicars, designed the first embossing and cutting machine, capable of punching holes, stamping decorations, and cutting out up eighty biscuits per minute from a moving sheet of dough. The dies were necessarily hand carved until engraving machines were introduced in the early 1900s. Thin, hard biscuits, such as the Rich Tea and Morning Coffee, are still made in almost exactly the same way. But the true golden age of biscuit engineering did not dawn until the invention of the rotary moulder in the late 1920s. This technology, albeit updated with variable speed controls, advanced non-stick coatings, and quality sensors, is still used to make Oreos and most other thick embossed biscuits today. The cookie dough is forced into negative moulds, which imprint patterns, brand names, and docker holes. 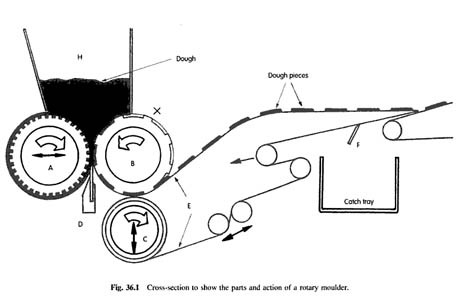 A scraping knife (“D” in the diagram above) scrapes off any excess dough to give a flat bottom, and the formed biscuits peel away onto a conveyor belt to be baked. 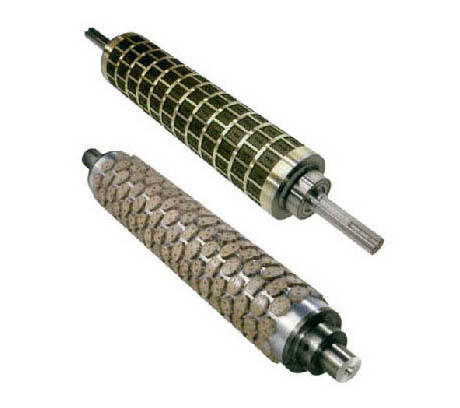 IMAGE: Weidenmiller rotary moulding rollers. This, then, is the enduring technology behind the blend of baking science and aesthetic appeal that is an embossed cookie. But what of the designers who created equally long-lasting moulds or dies? For the most part, unlike the Oreo’s William Turnier, they remain not only anonymous but completely disregarded. 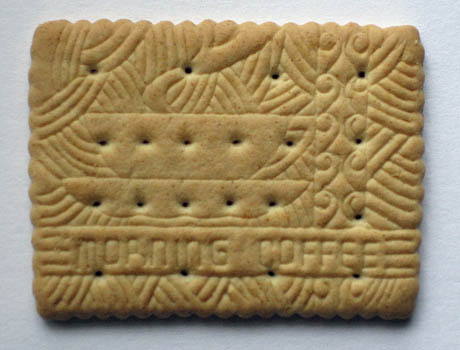 No one seems to know or care who created the stylized ferns on the Custard Cream, which remain unchanged since their debut in 1910; or the Art Deco steaming cup on the cardboard-like Morning Coffee biscuits of my youth. 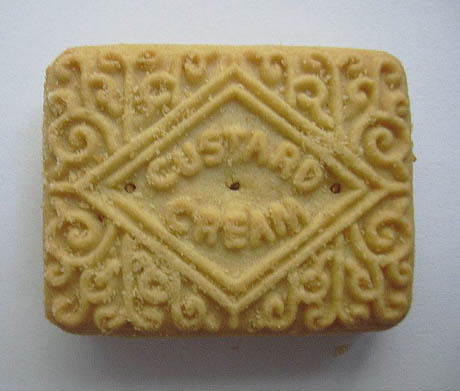 IMAGE: The Custard Cream: Britain’s favourite biscuit. Photo via Wikipedia. IMAGE: Lovely design, shame about the biscuit. A Morning Coffee, via. This tradition of biscuit design anonymity seemingly continues into the present day. The Weidenmiller company of Illinois, for example, promises that its team of nameless artists will “develop any design from a conceptual thought,” while Italy’s Errebi Technology offers more than 500 rotary mould shapes off the shelf — and utterly uncredited. 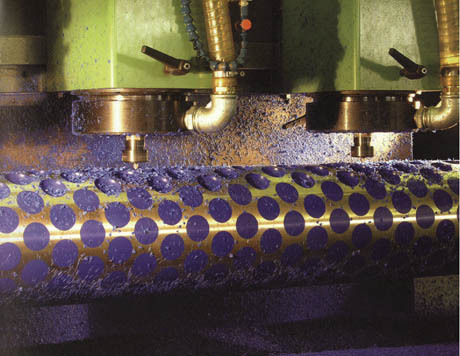 IMAGE: Machine carving rotary moulds today, courtesy Errebi Technology. IMAGE: Errebi’s ready-to-order emboss shapes, page 1 of 26. To my mind, these classic biscuits — ubiquitous, overlooked, and yet embodying the highest design standards in both form and function — are worthy of recognition as “humble masterpieces,” to borrow Paola Antonelli’s terminology. Time to make a nice cup of tea and appreciate one or two of them myself, I suppose. As a inhabitant of Britain it was nice to see an inclusion of the good old custard cream! although i would say its popularity was down to how cheap it is compared to other biscuits. another embossed English biscuit that once favourable amongst our island folk was one called “sport” biscuits. I’m not sure if they still produce them today but what made them different is that each one in the pack had a different design based around sports, snooker, football, running etc, and all scenarios where acted out by matchstick men. Thanks for a intriguing post, that i guess i would never have thought about whilst eating a biscuit. Here’s to the unsung heros. Really interesting article or a subject rarely touched upon. In old days, Tibetans also use wooden stamps to emboss breads. My sister have two of such old wooden stamps, one round and a square one. The patterns are very beautiful. Jim; Scotch is whisky, Scottish is of, or pertaining to, Scotland. This is a thesis worthy topic and the images are inspiring! I could definitely eat my way through the product list, although I might skip over the “cardboard-like” Morning Bisquit. @Kevin Gleig- It is a tragic story really- the nameless artists are orphans whose parents were lost in the Chicago Fire along with all records of their families. The Cross of Lorraine was also the symbol of the Free French Forces in World War II. so how did a company in Illinois manage to put together a team of nameless artists? did they find nameless people and train them in the art of biscuit graphics? did they find artists and ask them to renounce their names? do people really spend their lives researching biscuits and biscuit art? “biscuit” comes from the Latin for “twice-cooked” – shouldn’t it be “half-baked”? My Mother had an old wooden rolling pin that had depressions that was passed down from her Mother. Sister has it now and uses it to make scones in the Scotch tradition. Triangular in shape with a old tyme crest of a Lion with mail and crossed swords. Just love those sweet scones. I ate my Newman’s O’s without paying attention to the embossing. Will do so next time! I love the man-hole cover! Very original. His other work is beautiful as well- thank you for exposing this artist! Jane, you are completely correct! I apologise — they have actually sold an impressive and terrifying 491 billion to date (according to that fountain of all knowledge, Wikipedia). I’ve corrected it in the post. Thanks for pointing out my typo. As an aside, though, I find it telling that people feel they have to explain their spelling/grammatical mistakes on a biscuit website. It’s just the Internets, folks. No one is grading you on your posts. I am sure they have sold way more than 491 million Oreos. Couldn’t resist mashing up this theory with Banksy’s Obey poster. Hope you enjoy, comment either way though. Intriguing post! 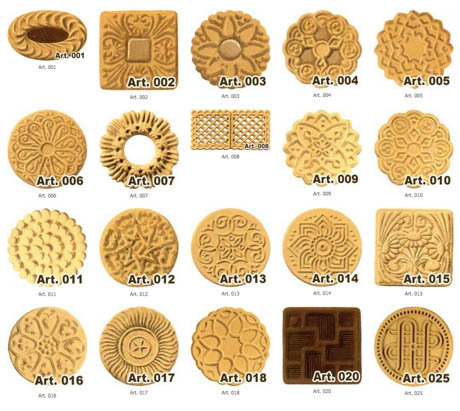 I went to the link of Errebi’s cookie molds and looked at all 26 pages — some wonderful designs especially the one’s in Art Deco style. Why have I been eating such boring cookies all my life? Great and original post. Beautiful design is everywhere. Its amazing that it should matter! How much consideration do we give a cookie before it is masticated to a pulp and enjoyed!? I’d say 2 seconds..! Very nice article. It me feel all warm and fuzzy.